The Gelco 9 in. x 13 in. 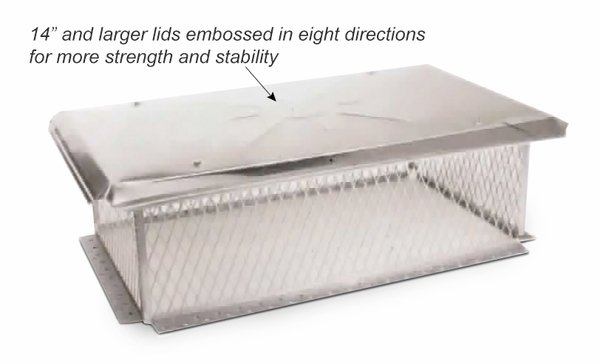 Base Stainless Steel Multi-Flue Chimney Protector Cap with Swingtabs does just what it's name suggests: It protects your chimney. And it's backed by Gelco's great, no-nonsense lifetime warranty. You'll love these great features and benefits. The Chimney Protector's impressive features are what make it one of the most popular chimney caps in the industry. Please Note: The Chimney Protector comes unassembled (knock-down). It comes with masonry anchors for mounting. SwingTab Reversible Mounting Strips. The unique design of the SwingTab allows you to simply swing the mounting strips in or out as needed for the best fit. No tools, no bolts, no awkward panels to assemble and reassemble. What could be easier? SwingTab reversible mounting strips give you more options for installation -- they might even eliminte the need for a custom made cap because SwingTabs give you increased installation versatility. Best Knock-Down Design On The Market. Hinged panels come partially assembled. Just swing them open, drop in two hinge pins, and you're ready to install. Just think, no panels to bolt together, no tools to fumble with. Wing Nuts or Cap Screws, Your Choice. 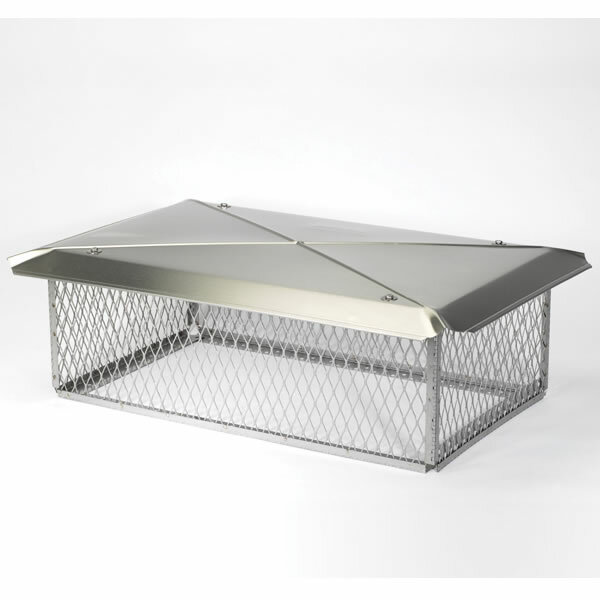 Just like with other Gelco multi-flue tops, the Chimney Protector lid attaches with either wing nuts or cap screws. You get hardware for both options in every Chimney Protector carton. Just select the lid mounting option that suits you. With the wing nuts, you don't even need a tool. Or, use a nut driver and snug it down with bolts. Either way, it's quick, easy, and secure as a lid can be. UL listing UL listed as part of a HomeSaver relining system using Pro, UltraPro, RoundFlex, RectangleFlex, or OvalFlex. Hopefully it will help a lot this winter. I really like this chimney cap and the was that it was designed. The swing tabs are a real plus and the cap was easy to put together and install. I would recommend that a few more screws be included with the hardware. For safety, you should probably wear a pair of work gloves as some of the edges can be sharp. Oh, yeah! I would buy this product again - no doubt about it! As others have stated, it is best to wear a pair of work gloves.